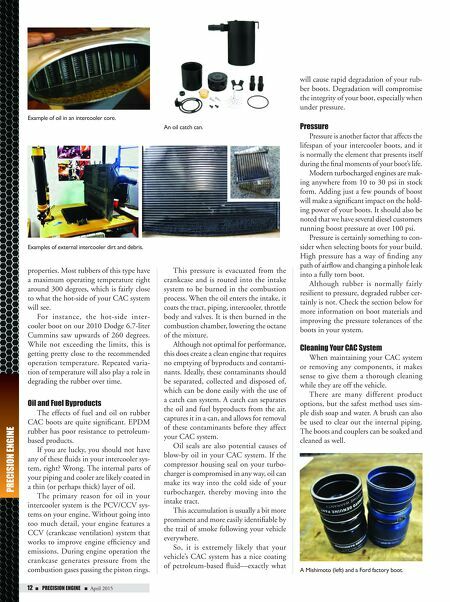 92 n Performance & Hotrod Business n April 2015 12 n PRECISION ENGINE n April 2015 PRECISION ENGINE properties. Most rubbers of this type have a maximum operating temperature right around 300 degrees, which is fairly close to what the hot-side of your CAC system will see. For instance, the hot-side inter- cooler boot on our 2010 Dodge 6.7-liter Cummins saw upwards of 260 degrees. While not exceeding the limits, this is getting pretty close to the recommended operation temperature. Repeated varia- tion of temperature will also play a role in degrading the rubber over time. Oil and Fuel Byproducts The effects of fuel and oil on rubber CAC boots are quite significant. EPDM rubber has poor resistance to petroleum- based products. If you are lucky, you should not have any of these fluids in your intercooler sys- tem, right? Wrong. The internal parts of your piping and cooler are likely coated in a thin (or perhaps thick) layer of oil. The primary reason for oil in your intercooler system is the PCV/CCV sys- tems on your engine. Without going into too much detail, your engine features a CCV (crankcase ventilation) system that works to improve engine efficiency and emissions. During engine operation the crankcase generates pressure from the combustion gases passing the piston rings. This pressure is evacuated from the crankcase and is routed into the intake system to be burned in the combustion process. 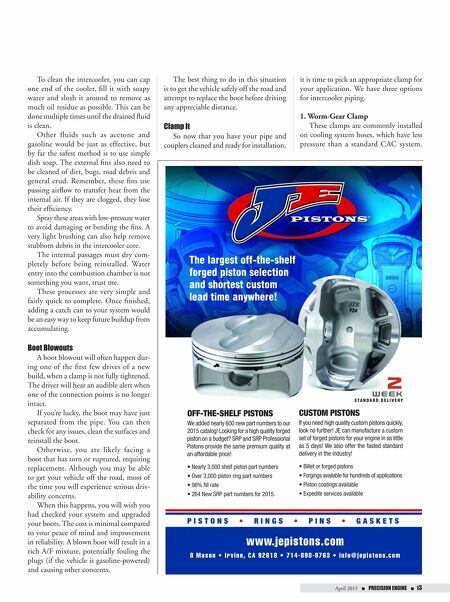 When the oil enters the intake, it coats the tract, piping, intercooler, throttle body and valves. It is then burned in the combustion chamber, lowering the octane of the mixture. Although not optimal for performance, this does create a clean engine that requires no emptying of byproducts and contami- nants. Ideally, these contaminants should be separated, collected and disposed of, which can be done easily with the use of a catch can system. A catch can separates the oil and fuel byproducts from the air, captures it in a can, and allows for removal of these contaminants before they affect your CAC system. Oil seals are also potential causes of blow-by oil in your CAC system. If the compressor housing seal on your turbo- charger is compromised in any way, oil can make its way into the cold side of your turbocharger, thereby moving into the intake tract. This accumulation is usually a bit more prominent and more easily identifiable by the trail of smoke following your vehicle everywhere. So, it is extremely likely that your vehicle's CAC system has a nice coating of petroleum-based fluid—exactly what will cause rapid degradation of your rub- ber boots. Degradation will compromise the integrity of your boot, especially when under pressure. Pressure Pressure is another factor that affects the lifespan of your intercooler boots, and it is normally the element that presents itself during the final moments of your boot's life. Modern turbocharged engines are mak- ing anywhere from 10 to 30 psi in stock form. Adding just a few pounds of boost will make a significant impact on the hold- ing power of your boots. It should also be noted that we have several diesel customers running boost pressure at over 100 psi. Pressure is certainly something to con- sider when selecting boots for your build. High pressure has a way of finding any path of airflow and changing a pinhole leak into a fully torn boot. Although rubber is normally fairly resilient to pressure, degraded rubber cer- tainly is not. Check the section below for more information on boot materials and improving the pressure tolerances of the boots in your system. Cleaning Your CAC System When maintaining your CAC system or removing any components, it makes sense to give them a thorough cleaning while they are off the vehicle. There are many different product options, but the safest method uses sim- ple dish soap and water. A brush can also be used to clear out the internal piping. The boots and couplers can be soaked and cleaned as well. Example of oil in an intercooler core. An oil catch can. Examples of external intercooler dirt and debris. A Mishimoto (left) and a Ford factory boot.